Regarded as Turkey's "National Treasure," the National Library of Turkey has more than 350,000 books and documents rotting in storage. However, these works have now been brought to light thanks to an initiative by the Ministry of Culture and Tourism. The organizing and cataloging of these 350,000 books and documents, which are rare and unique, is almost complete. Following an investigation at the library about a year ago, it was discovered that more than 350,000 books had been neglected in storage and covered with spider webs. Upon the instructions of Culture and Tourism Minister Ömer Çelik, the rehabilitation of the books began immediately. Moreover, library officials discovered that tens of thousands of books were sold for TL 0.15 ($0.06) per kilogram as waste paper during the same period. Therefore, the directorate began searching for books that had actually once belonged to the library. 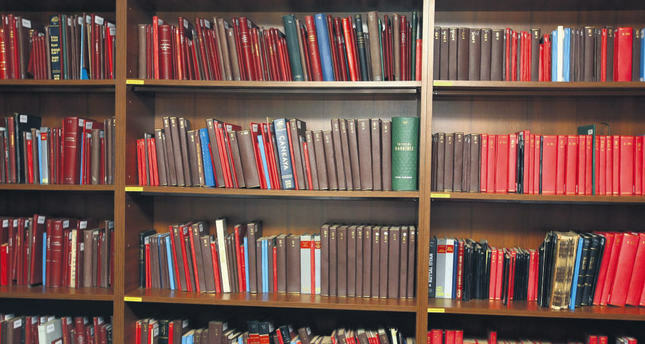 As the organizing and up to 70 percent of cataloging of the books is finished, 220,000 books are now are registered in the system and are ready to be viewed by booklovers as well as academics and researchers. Once the cataloging of the remaining books whose languages are not well-known or familiar to the organizers is finished within the year, thousands of rare documents will be saved from irreparable damage and will become available to interested readers. Among the tens of thousands of books that have been brought to light is the Türkocağı Collection, composed of 40,000 books including hundreds of Ottoman Turkish manuscripts. The collection, which was given to the National Library, also includes paintings describing the Battle of Sakarya and "Misak-ı Millî" (National Pact or National Oath). Also, a 450-year-old hand-written Islamic law book, other books about medicine, Islamic law and tafsir books dating back to 800 A.D., documents in Serbian, Armenian, Farsi, Hindi and Urdu, as well as the libraries of Mustafa Fehmi Gerçekler – who was a deputy for 30 years for the foundation of the Grand National Assembly of Turkey, and his son, Tevfik Gerçekler, will offer their services to everyone as soon as the rehabilitation and restoration works of the books are finalized.